We are excited to introduce Rx Order Templates, which enable you to easily save medications and specifications (Sig, Qty, RF #) frequently used by your practice. They are available for all Rx order forms, including OTC, Controlled Substance, Discontinued Meds and New Meds. This feature is a direct result of your suggestions about how we can save you time and enhance the Elation experience! As a thank you, we have pre-populated 20 templates for each practice that represents your most frequently prescribed scripts in the last 90 days. Note: We will not pre-populate templates for practices that have utilized the feature prior to December 1st, 2016 to ensure that your curated templates are left undisturbed. Add new, edit existing and/or delete order templates by opening Practice Settings and selecting Medications. Organize the list by clicking on the template name and dragging it to the placement that makes the most sense for your practice (ex: alphabetical, most frequently used). 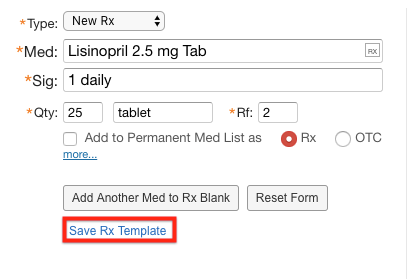 Access saved order templates while in a patient's chart by clicking More and selecting Rx Templates. Choose the desired template so Elation can automatically open and pre-populate the relevant order form on your behalf. Saved templates will also display in a new order form when they match your search criteria as shown in the example below. Complete the Rx order form (medication name, sig, Qty, RF #) and then simply click on the blue Save Rx Template text highlighted below. This will store the information in your practice setting to easily find in the future.